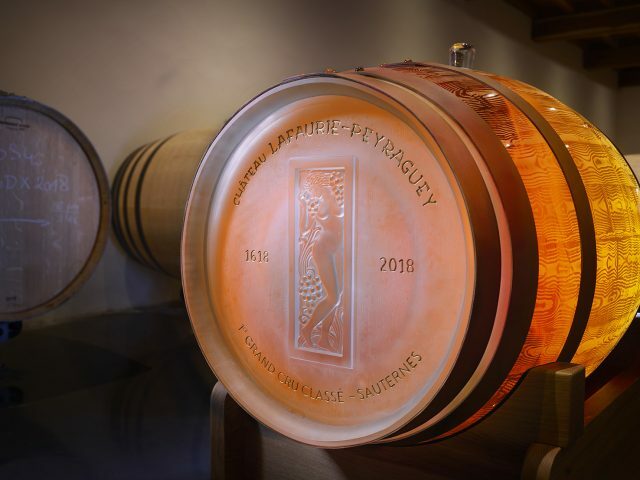 Glassmaker Lalique created an exact replica of a 225-litre barrique made of crystal and filled it with Sauternes to celebrate the 400th anniversary of Château Lafaurie-Peyraguey. The premier grand cru classé estate is owned by the CEO of Lalique, Silvio Denz, and the barrel will remain on display at the château alongside other unique pieces including a six litre (imperial) bottle made of crystal. The wine used to fill the barrel is from the 2013 vintage, the first to be vinified at the château under Denz’s ownership and the whole idea of the concept was to celebrate the estate’s 400th anniversary from 1618 to 2018. The barrel itself took over two years to make and used a technique known as ‘lost-wax casting’ that was used extensively by Lalique up until 1930 but is rarer today as it is used for objects cast in one go and so requires an immense degree of skill. As well as being made from crystal, the barrel is ‘bound’ by leather straps designed to imitate the metal hoops that hold a traditional oak barrel together, but these have been secured with cabochons of crystal and the opening of the barrel with a crystal bung. On the barrel’s front face is an engraving of the ‘Femme et Raisins’ motif that René Lalique created in 1928, originally for the first-class sleeping cars on the Côte d’Azur Pullman Express.